The East Gate was built in the irimoya zukuri (hip-gable roof) fashion, a style utilized in many Edo-period farm houses of the Kasama region. 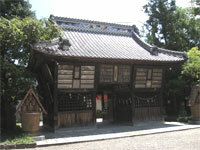 Roofed in tile decorated with mortar motifs, the gate is divided into four areas, which hold offerings under the imperial seal received at the time of the festival of months (tsukinami-sai ), together with two black and white wooden dedicatory horses ; dedicatory plaques presented by worshipers are hung on the sides of the gate. When first built, two of the areas held guardian deities called Zuishin, but they were moved to the new Two-Storied Gate when it was built, and this gate was renamed the "East Gate."